Engine cooling has always been an issue on the Caddy since the 1.8T transplant. It is not that surprising, as it now generates more than three times the power it came out of the factory with, and the associated increase in heat generation was never going to be insignificant. When the same engine was in the Felicia, the coolant temperature gauge generally sat just above the ‘normal’ mark, but quickly went up in traffic unless the radiator fans were switched-on. The thermostatic switch for the fans had never worked reliably, and manual over-ride had been wired to the HRW switch and tell-tale, and I replicated this in the Caddy. During the transplant the radiator fan circuit in the Caddy had been modified to be a hybrid of the petrol (single speed fan, no relay) and diesel (two stage fan, relay switching) such that it operates both fans at a single speed, switched via the relay. With the new circuit in place in the Caddy, I succeeded in getting the thermostatic switch to activate the fans, and realised that it also illuminated the dashboard tell-tale when it did so, which I like. After the transplant into the Caddy, the coolant temperature gauge would go up pretty quickly after start-up to settle at about 100˚C, where it would stay during normal driving. In traffic it would shoot up from there towards the red if unchecked by the fans, although they would bring it back down to an indicated 100˚C pretty quickly. Despite showing some high temperatures at times, I rarely saw the tell-tale indicating that the thermostatic switch had kicked-in, and I never saw (or smelled, heard) symptoms of over-heating. I concluded that the coolant temperature gauge circuit was not indicating correctly, and embarked in trying to work-out why. In unmodified cars, a problem such as this is usually caused by a component failure. This is also likely in a modified car, but it is also possible that components which were not designed to work together are individually operating as they should, but are not working together properly so that their operation is not having the desired effect. 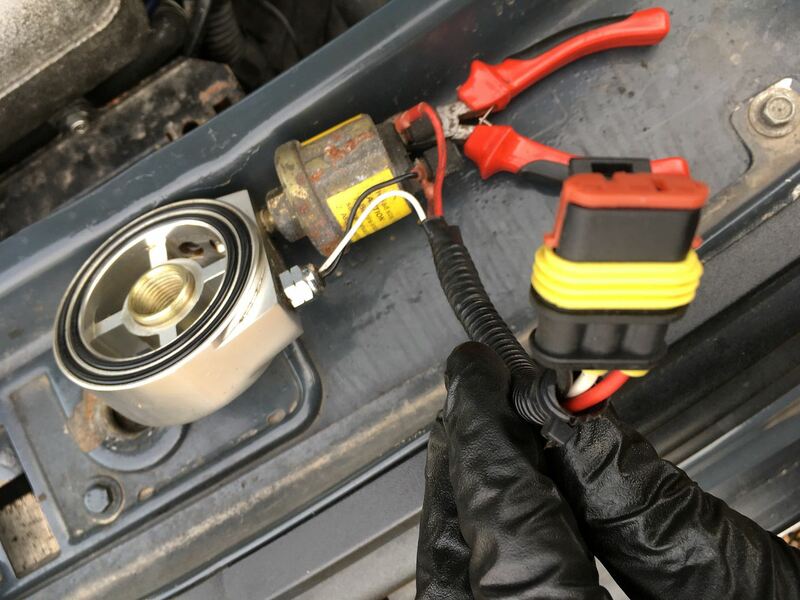 Once I started reading-up on the various specifications of coolant temperature senders fitted to VAG cars, and some of the problems this has caused after modifications, I decided that what I was seeing was a similar issue. This is probably well known to many on here, but the VAG 4-pin temperature sender is two separate sensors, both of which vary resistance with temperature independently. One pair of pins provides engine temperature to the ECU, while the other pair of pins are those which drive the coolant temperature gauge. The resistance of the two sensors is not necessarily the same at any given temperature. It may have been more straightforward for the engine swappers among us if VAG had fitted two separate senders, but they did not. As the engine was running well, it appeared that the ECU half of the sender was doing what it should, but the gauge half was not. ... and with various Felicia/Caddy looms which I buzzed-through trying to find a phantom resistor which I had read somewhere was in some models and not others. After all this, my conclusions were... sadly inconclusive :-(. 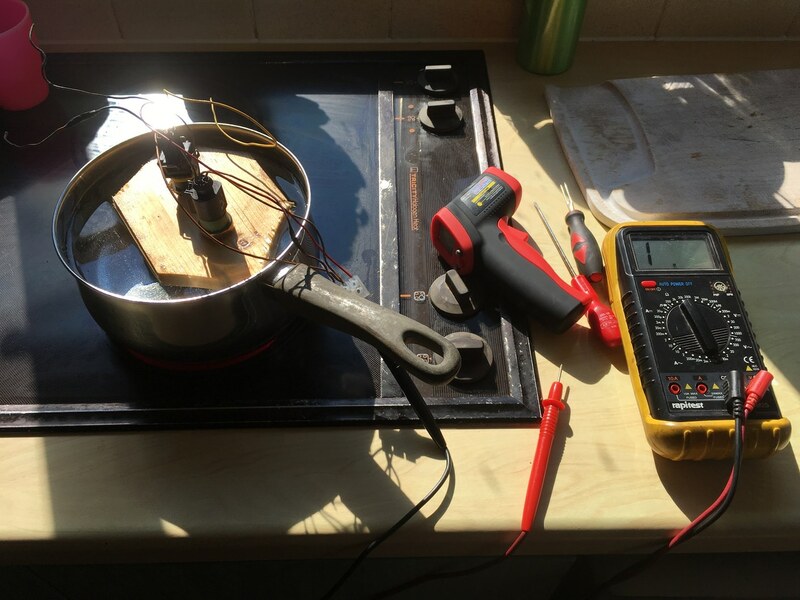 I was pretty sure that I needed to add a resistor into the gauge circuit, in series with the sender, to get the gauge to read accurately, but I was struggling to work-out the value of resistor I needed. Searching online to find what resistance values others had used I came across a thread about someone experiencing similar problems after he had fitted a 1.8T. 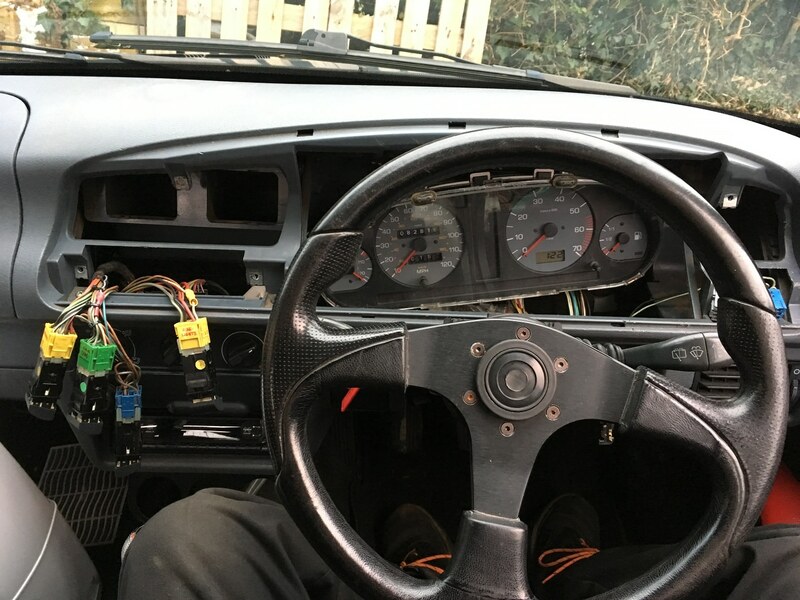 He had asked for advice about what resistor he needed, and someone had pointed him in the direction of the temperature sender fitted to the mk2 Golf GTi 8V, which apparently has the correct characteristics for the 1.8T ECU and the older temperature gauges. That sounded worth a try, especially as I had one of those senders in my garage. 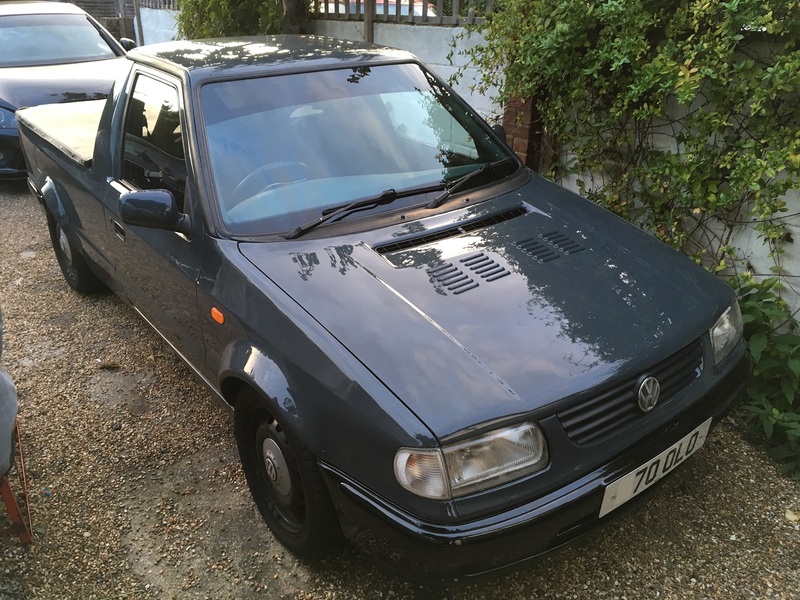 Two minutes later, the mk2 Golf sender was fitted in the Caddy, which then started and ran fine (positive indication #1) and had the coolant temperature gauge settling on the ‘normal’ marking (around 90˚C). Success! In this instance, if I had tried mindlessly swapping parts rather than trying to be clever and methodical about it, I would have got to the answer much more quickly. I had to solder in-line a 30k resistor to operate my gauge on a mk2 gti clocks. 30k is significantly higher than any of the resistance values I measured. I assume you mean mk2 Golf GTi gauges, that you are using? That makes more sense now, thanks for the correction. And that was to enable me to use the green d shaped plug, you must’ve of gone for the blue or black 4 pin sensor then? I have the black sender with the yellow band, as opposed to the black sender with the blue or green band. I was not a fan of the aftermarket steering wheel that was in the Caddy when I bought it, but it took me ages to make-up my mind as to what I wanted to replace it with. I had a Momo suede rally wheel in the Felicia 1.8T, but that wheel was more suited to a track car. I considered fitting one of the various styles of wheel available on the Felicia / Caddy range, but none of them that I have tried have been that nice to use. 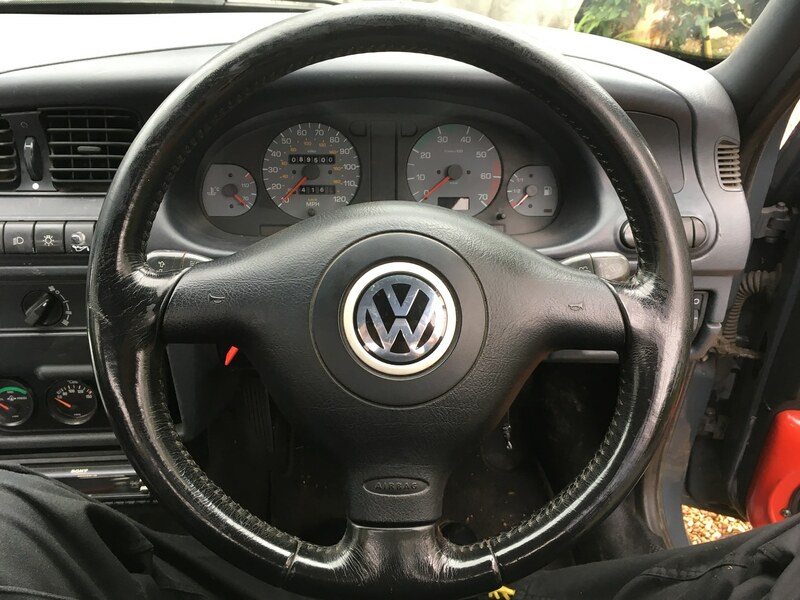 After a prolonged period of indecision reminiscent of my partner in a shoe shop, I decided I wanted a three spoke leather wheel like the one fitted in the mk4 Golf GTi. Little did I know this would open up a world of small spline / large spline confusion. This was the old wheel, pictured during some earlier dashboard experimentation, and without its rubber centre cover. I bought a Golf wheel off eBay, and ordered an adaptor to allow the (large spline) wheel to fit the (small spline) Caddy steering column. When I removed the old wheel, and went to slide the adaptor onto the column, it would not fit. I tried easing it on with a little coppergrease, and I tried decreasingly gentle levels of persuasion, but it was not happening. The old wheel went back on, and I went back to the drawing board (well to the internet, actually). I found threads about the spline adaptors on a number of VAG forums, and a few of them said that they can be difficult to fit onto the column, as they are a tight fit, so some force may be required. That convinced me that I had not been sufficiently determined, so when I got the chance a week or so later, I removed the old wheel to try again. This time I tried persuading the adaptor into place using a hammer and a brass drift. It was still not happening. By this point I was confused and frustrated. I think of myself as being an experienced amateur mechanic, but swapping a steering wheel was defeating me. In desperation, I resorted to counting the splines on the steering column and the inside of the adaptor. Given that I am long-sighted, this was no easy task, and I failed to determine exactly how many splines each part had, but I did convince myself they were not the same. I then started wondering whether the Caddy column was evidence of its pre-VAG Skoda origins, and was not ‘standard’ VAG small splines at all. This theory was only disproved after I had done some experimenting with steering columns and wheels from my SEAT Ibizas, which demonstrated that the Caddy column splines were the same as those on the Ibiza. So, I ordered another spline adaptor. When the second spline adaptor arrived, I tested it on a Felicia steering column I had in the garage, and then on the Golf wheel, and confirmed that it fitted both of them before I attempted to fit it into the Caddy. When the opportunity came to fit it, my son was doing it whilst I was working on something else. He removed the old wheel (yet again), but then called me over as the adaptor would not fit onto the column. I had a moment or two of confusion and panic before I realised that there was already a spline adaptor on the column! The old wheel had been fitted using a spline adaptor, but on all of the numerous occasions I had removed that wheel (probably 10-12 times for various jobs) the adaptor had always come off with the wheel, so I had never noticed it. After all the confusion and messing about trying to source the correct adaptor, I had one all along, but I only found-out when I had found the solution anyway. Finally I was able to get the Golf wheel fitted, and the look and feel of it makes the effort worthwhile. I still do not know what the story is with the first spline adaptor I bought. It does not fit any steering column I have, although the outer splines are the VAG large splines pattern. I have stashed it in the ‘just in case’ box in my garage, where it is far from alone. Much as I am happy with the new steering wheel, fitting it had an unfortunate consequence. The centre of the Golf wheel is larger than the old wheel and this makes it difficult to see the bottom row of dashboard warning lamps when the wheel is in some positions. The camera angle in the photo makes this look much worse than it is, and I am not worried about seeing the hazard warning, brake fluid level, alternator, or handbrake lamps all the time, due to the nature of what they are telling me, but if the oil pressure warning lamp comes on I want to know about it immediately. It would not have been that hard to rearrange (and re-wire) the warning lamps in the instrument cluster, but I decided to go another route. The replacement oil pressure sender I fitted had an oil pressure switch incorporated, which I had not initially connected. I now ran a wire from this sender terminal to a second oil pressure lamp which I fitted into a switch blank in the centre of the dashboard. 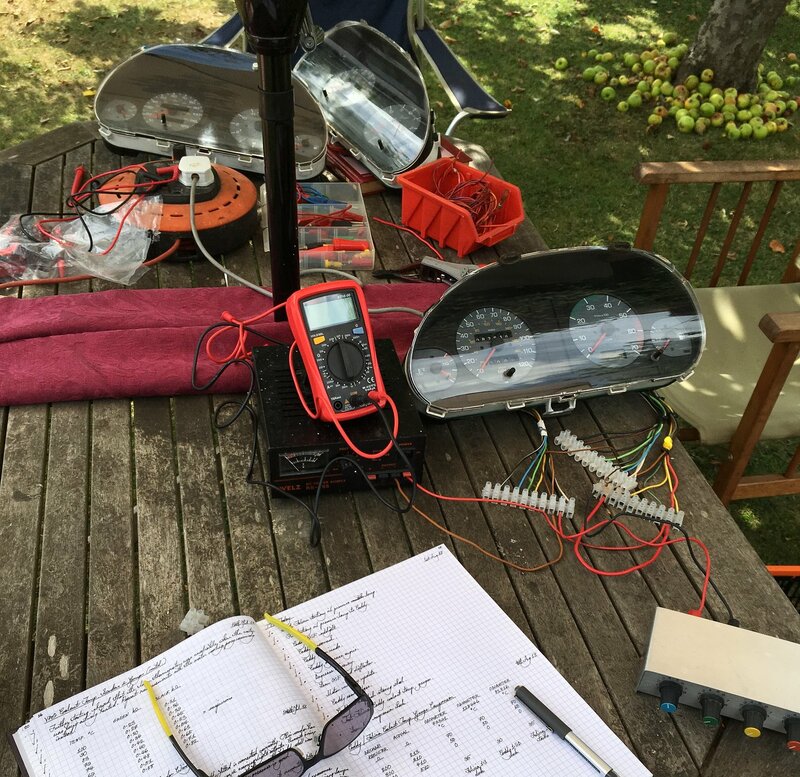 This second lamp is a very bright 10mm LED which I had previously used in the Felicia 1.8T, and which you cannot miss if it illuminates. I like the peace of mind which comes from knowing I have two independent oil pressure warning circuits (plus the gauge!). The steering wheel centre horn push on the old wheel was unreliable, so I had wired a second horn button into the dash. This remains in use as I have not (yet) connected the horn push on the Golf wheel. 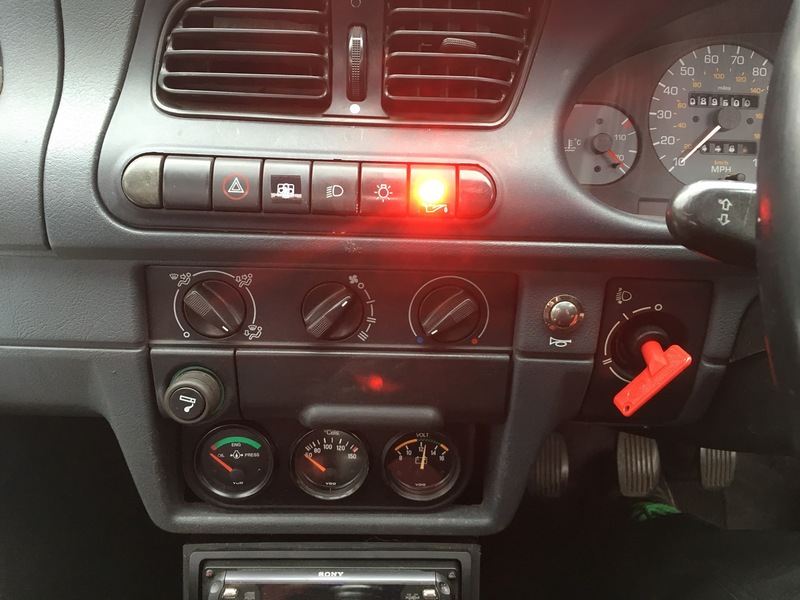 The picture shows the LED oil pressure warning lamp, the horn button, and the HRW switch wired as a radiator fan over-ride, all resplendent with symbols I bought from Vehicle Wiring Products many years ago. Thanks. It is a fair comment about the notch in the slam panel, and I did think about how else it could be done before I settled on that. I really wanted to leave as much of the slam panel in place as possible, and I felt that giving the cut-out gentle curves would just need too much metal to be cut away. Last edited by bete noir; 30-08-2018 at 08:50 AM. I thought my steering wheel shenanigans were just a minor inconvenience / embarrassment, if I had realised this was a "monumental stupid f*ck up" I would have kept it to myself, like all the others! Ever since the engine transplant, there has been a slight oil leak from around the area of the oil filter housing. I had never seen the oil level drop noticeably, but there were always a few spots on the ground wherever the Caddy had been parked. JKM had noticed it, and had replaced the washer on the oil pressure switch, which improved things but proved not to be a complete cure. It was very difficult to see where the oil was coming from, not helped by the lack of space around the engine, but it appeared that the leak was from the oil seal at the top of the sandwich plate between the filter and housing. I had bought the sandwich plate used, as I mentioned in a previous post, and it was not a great quality part. The oil seal in particular was fairly unsubstantial, as can be seen in the picture. This sandwich plate went in the aluminium bin at the local dump, and I replaced it with a new part, which had a single more substantial oil seal rather than the two O-rings which had hardened and flattened with age. When I swapped the oil pressure sender and switch over I applied a couple of drops of thread sealer as an extra precaution. With the new sandwich plate fitted, the oil leak was further reduced, but maddeningly still not to zero. 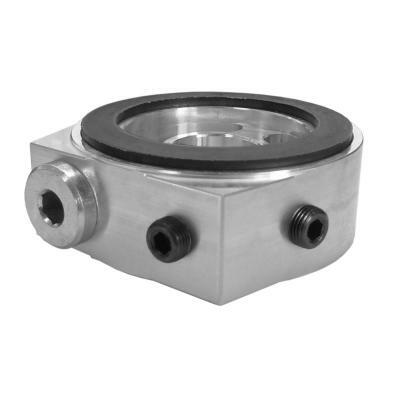 The O-ring on this one is a substantial part, and spares are available separately. I do not plan to use lower quality sandwich plates on any of my cars in the future. With everything back together, complete with the Mocal sandwich plate, things were definitely improved again, but still I was seeing a couple of spots of oil where the Caddy had been parked, and they still seemed to be emanating from the area of the oil filter housing. On a hunch, and because I could not think of a more plausible explanation, I removed the standard oil pressure switch again. The sealing washer had been replaced previously, as mentioned above, but when I took it off I could see that this washer, an aluminium part, did not look in great shape. I re-fitted the switch with a replacement copper washer and, finally, no more oil leak. Having tinted sunstrips on my cars has become a habit since I first had one put on my Evo VIII almost 15 years ago. It was not my plan to have one in the Caddy, for aesthetic reasons, because a sunstrip can look a bit ‘scene’, whereas I am aiming for a more classic look. I relented for practical reasons i.e. I have got so used to having a dark strip at the top of my windscreen that it felt wrong (and sunny) without one. 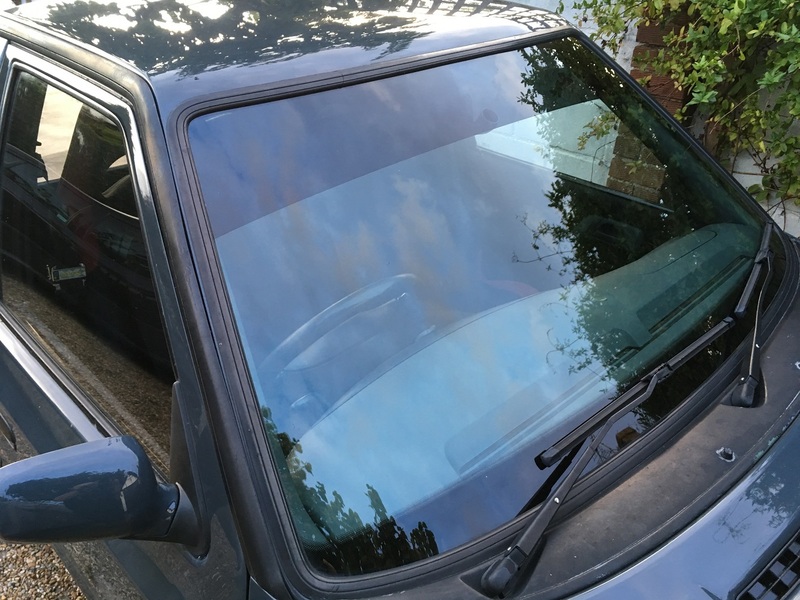 I took the Caddy to South Coast Tints in Southampton, who have always done a fantastic job, and I am similarly pleased with the outcome this time.